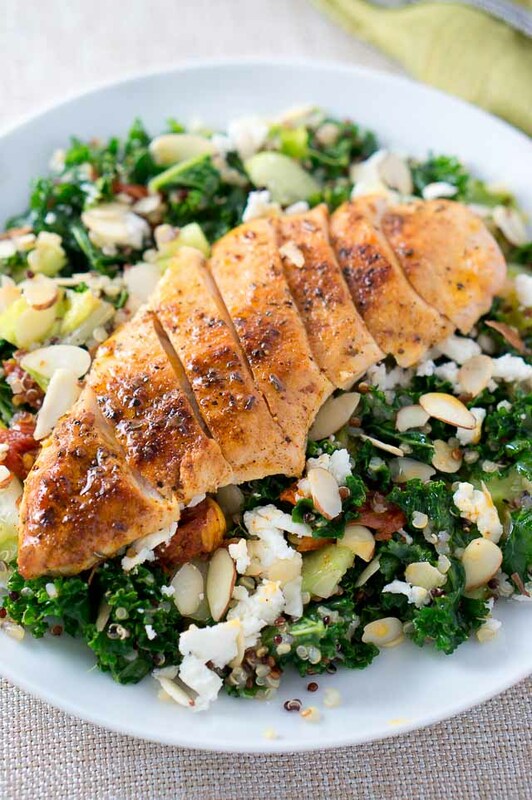 I am really excited to share with you this recipe for Greek Quinoa Salad with Chicken. This Mediterranean salad is delicious and easy to make, the quinoa and chicken can easily be made ahead to pack for lunch throughout the week. And putting the salad together is effortless and super quick. Only about 15 minutes to cook everything and 5 minutes prep work. I love easy meals like this one especially during the week when I don’t have much time to cook after work. Kale and quinoa are super foods and are loaded with good for you nutrients. So fresh and healthy! If you leave out the chicken, this also makes a great side dish for fish, perfect for BBQs and backyard parties! You can totally adapt this to your taste, leave out what you don’t like, add more of what you do like. A great and easy salad for this Spring or Summer! 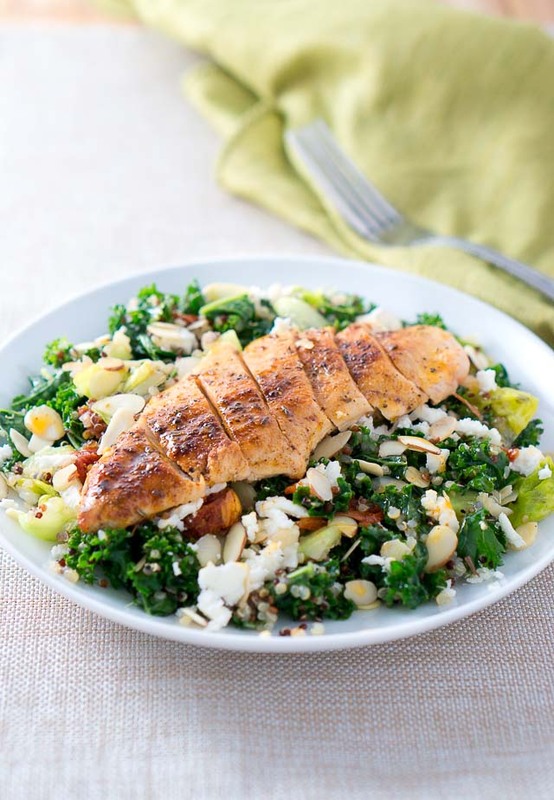 Hope you enjoy this Greek Quinoa Salad with Chicken! While quinoa is cooking, heat oil in a skillet and cook chicken breasts for about couple of minutes on each side. Slice each chicken breast. Add cooked quinoa, chopped cucumber, sun-dried tomatoes, white wine vinegar to the salad and season with freshly ground black pepper and salt, if necessary. Toss salad ingredients and serve on plates. 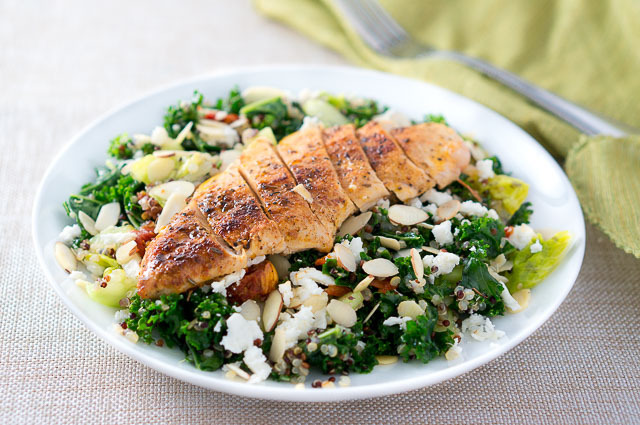 Top with sliced chicken breasts, sliced almonds, and optional crumbled feta cheese. 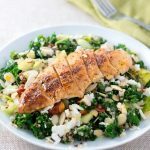 Greek Quinoa Salad with Chicken - This Mediterranean salad is delicious and easy to make, it can easily be made ahead to pack for lunch throughout the week. I love kale salads all chopped up like this! The addition of sun-dried tomatoes and feta is soooo good! This sounds fantastic, healthy, and awesome for meal prep! I love quinoa and I love Greek flavors. I want this everyday for lunch. Salmon is one of my favorites to serve my family! Especially on hot days like this. I’m going to try this recipe this weekend! That quinoa salad looks like the star of the show! Totally adding this to my weeknight rotation! And I know my hubby will love having the leftovers packed in his lunch! Love all the flavors in this! It’s perfect for a healthy lunch or dinner. This looks so so good!! !